Obituary for Elizabeth W. Davis | Hooper Memorial Home Inc.
Julia Elizabeth Ward Davis, oldest daughter of Reverend and Mrs. Beverly M. Ward Sr., was born August 25, 1917, in Plainfield, NJ. She was preceded in death by her siblings Beverly Ward, Jr., Cornelia Ward Van Blake, and Frederick Thomas Ward. Educated in public school, she graduated from high school at St Augustine’s College Preparatory School and attended Howard University. She married John Dawson Davis Sr., in 1947. There are three children from that union. They are John Dawson Davis II, Meryll Elizabeth Davis, and Chandon Ward Davis. By Mr, Davis previous marriage, there was also an older step daughter, Barbara Davis Blackwell, who is deceased. Elizabeth has one grandson, Dan, son of Meryll Davis. Elizabeth also has several nephews, nieces, grand-nephews, and grand-nieces who are the family of her sister Cornelia. 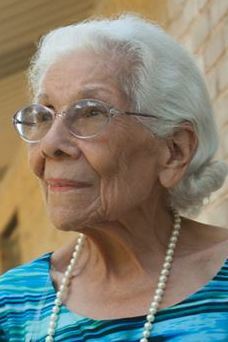 She has been a member of Capital United Presbyterian Church since 1948. She served as an active member of the Women on the Move of Hodges Heights in Lower Paxton Township circa 1971 to 1979. As a result of her employment at Sears and Roebuck, she became an active member of the “Sears Girls” social club after retirement in 1979. Lastly, she served on the Urban League Guild, Harrisburg, circa 1992 to 2001.